My research studies a molecule called microRNA. Don’t feel bad if you’ve never heard of it, since microRNA is a fairly new discovery. The first microRNA was discovered in 1993, and the second one wasn’t discovered until 2000. We’ve discovered thousands of microRNAs by now, but they’re still not something all biologists are familiar with, let alone non-biologists. I know when my advisor initially suggested I study microRNAs, the first thing I had to do was go read the Wikipedia article. I knew nothing! So what the heck is a microRNA? As the name implies, it’s a very short RNA found in plants and animals. Its function is a little more complicated, so let’s back up a bit. Most people have heard of the “Central Dogma” from their high school biology courses: DNA is transcribed into messenger RNA, which is then made into protein. DNA serves as the “blueprint” for how to make an organism.The messenger RNA, which as the name suggests, serves as an intermediate messenger between the blueprints in the nucleus of a cell and the machinery out in the cyotplasm. Once in the cytoplasm, the messenger RNA is read by a ribosome, which produces a protein based on the instructions originally encoded by the DNA. Messenger RNA can be made in varying quantities, and more messenger RNA leads to more proteins being made. The amount of proteins made is just as important as the type of protein being made. Genes are “off” if no protein is produced, and varying quantities of a protein can have profound effects on how an organism functions. This is why large chromosomal duplications are generally lethal or have major effects (like Down Syndrome) – with an extra chromosome contributing to protein production, protein levels are totally out of whack. But the Central Dogma isn’t so dogmatic. This is where microRNA comes in. In animals, micoRNA functions as part of a protein complex called the RNA-induced Silencing Complex (RiSC). MicroRNA guides RiSC to a particular messenger RNA through complementary basepairing – the A in microRNA matches with a U in messenger RNA, the G with a C, etc. RiSC will then block from becoming a protein. RiSC can do this by directly degrading the messenger RNA, de-adenylating the messenger RNA’s poly-A tail to lead to degradation, or by recruiting other proteins to get in the way of translation into a protein. So when microRNA targets a messenger RNA, it results in that messenger RNA producing fewer proteins than usual. If enough microRNA is made, it may turn the gene off completely. MicroRNA is especially important because one microRNA can have dozens to hundreds of messenger RNA targets. This means a single type of microRNA can have really profound effects on an organism. It’s one of the most important regulators of gene expression, and is involved in key biological processes like the differentiation of stem cells into specialized adult cells, cell proliferation, metabolism, and apoptosis (programmed cell death). Because it’s so important, most microRNAs are highly conserved across animals. This is also why microRNA has been heavily implicated in cancer – one small tweak can have drastic effects. Stay tuned for more riveting information about microRNA evolution later! This is post 6 of 49 of Blogathon. Donate to the Secular Student Alliance here. I knew it was false. I don’t have an evolutionary tree of every species in my head, but I had heard of this comparison before. People intuitively think dogs and cats are more closely related because they’ve both been domesticated – but that has nothing to do with evolution. I also knew this was an example of an evolutionary tree that had been tweaked as we gained more knowledge. Very preliminary, simple genetic studies shows dogs more closely related to cats. But as we expanded the comparison to the whole genome, we found that dogs were more related to bears. My family immediately started giggling. “Good job, Miss PhD.” This would not stand. I flipped out the iPhone and searched for a modern phylogenetic tree of carnivores. I immediately found one in Nature Reviews Genetics based on karyotype data, indeed showing that dogs were more closely related to bears than cats. I pointed at the image on my screen. “Too bad” my family said, as they continued on with the next question. 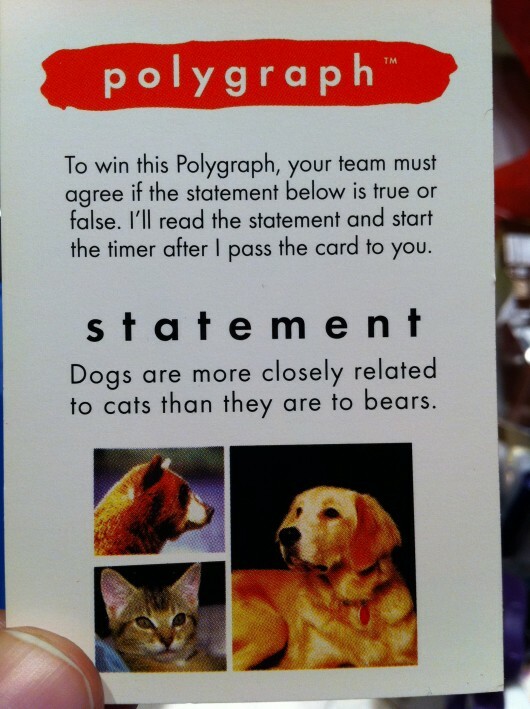 It may no longer matter for the game (though my team did win – neener neener), but in case you’re interested… yes, dogs are more closely related to bears than cats. They’re all carnivores. Dogs and bears both belong to the suborder Caniformia, while cats are in suborder Feliformia. So why was Cranium wrong, if it’s claiming its answer is based on genetic information? The answer lies in the date. I checked the box, and this edition of Cranium was made in 1998. In the rapidly expanding field of evolutionary genetics, that’s ancient. We can now compare whole genomes, while before we were limited to a single gene (at best). Different parts of the genome can evolve at different rates if they’re under selection (or not), so it’s important to look at the big picture instead of a tiny snippet. Our methods and technologies are improving, so our results get more and more accurate. That was my first time giving that talk. From the Q&A and questions I got afterward, I certainly know what sort of stuff I need to add, subtract, or explain better. If there’s still anything you don’t quite get about genetics, feel free to leave a question in a comments. The marijuana genome has been sequenced by researchers at the University of Toronto and University of Saskatchewan. It’s actually a pretty neat study. They compared two strains of Cannabis sativa: Purple Kush (a “potent” strain used for getting high) and Finola (a hemp cultivar). From looking at the genome alone, researchers weren’t really able to find any striking differences. But then they turned to the transcriptome. What the hell is that? Time for a quick flashback to high school biology! 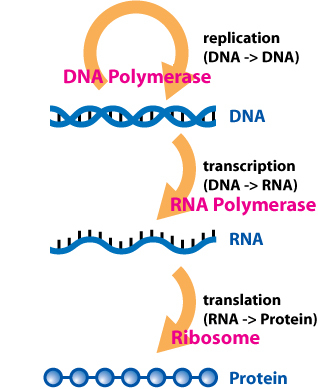 DNA is transcribed into messenger RNA. That mRNA leaves the nucleus and heads out into the cytoplasm, where ribosomes use it as a set of instructions on how to make protein. A “transcriptome” is all of the mRNA produced by an organism. And yes, it differs from a genome – some genes are highly expressed and produce lots of mRNA, others can be completely turned off, and many are somewhere in the middle. The quantity of mRNA is something marked in the transcriptome. By looking at the transcriptome, they were able to find that Purple Kush exclusively expresses the gene involved in the production of THC, the psychoactive component of marijuana. The hemp strain, on the other hand, didn’t express this gene at all, despite having it in the genome. You can check out a draft of the paper at Genome Biology, and even search through the marijuana genome here. Attendees at Burning Man, the famously free-wheeling yearly Nevada art gathering, don’t usually take note of new genomic sequences, but they may want to check out a paper published today in Genome Biology. Maybe this is just because I’m in Seattle, but I’m pretty sure I’m in the minority in my field because I never tried pot. How dare they imply that stoners aren’t interested in genomics when they’re the ones sequencing the genomes. Especially when Francis Crick admitted to experimenting with LSD when he discovered the structure of DNA. Our field is apparently inspired by psychoactive drugs. And my response is usually to laugh, because that’s precisely what makes science so wonderful. We don’t stick with some dogmatic book even when faced with mountains of contrary evidence. We’re constantly trying to figure out where we’re wrong, so we inch closer and closer to an understanding of reality that’s based on…well, reality. Finding out we were wrong and correcting that mistake is the beauty of science. I bring this up because a recent news story illustrates this perfectly to me. You may have seen the story circulating that non-African humans are part Neanderthal. Yes, some Neanderthals and Homo sapiens interbred back in the day! At first I was a little confused, because I thought we had established this in May of 2010 when the Neanderthal genome paper by Svante Paabo’s group came out. But this new paper serves as a confirmation of that work, since it avoids one of the main criticisms of the study – that the human and Neanderthal DNA were cross contaminating each other. This new research only looked at human DNA, and compared it to the Neanderthal sequence. What they found was that about 9% of the X chromosome has a Neanderthal origin in non-African humans. But if I go back to just April of 2010, everything was different. I was taking my 500 level Evolution class at Purdue, about to graduate. Our final project included downloading mitochondrial DNA sequences of humans, Neanderthals, and other apes to determine if humans and Neanderthals had interbred. From that data alone, the conclusion was an obvious “no.” And that’s what all prior knowledge had said up until that point. I remember one of the last questions on the project being to explain how new information could potentially change this viewpoint. We needed the whole genome before we could definitively say Neanderthals and humans didn’t interbreed! Mitochondrial DNA is only a tiny part of the whole genome. We need more information because we’re so closely related. 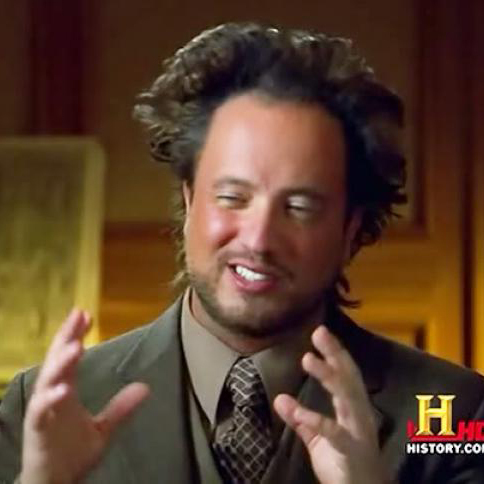 And what if only Neanderthal males were the ones mating with humans? Then no Neanderthal mitochondrial DNA would be passed on at all! One year later, and my professor has to totally redo his lesson plans. And that’s what makes science awesome. This is post 3 of 49 of Blogathon. Pledge a donation to the Secular Student Alliance here.